The oldest musical ensemble at the University of Virginia is holding auditions! 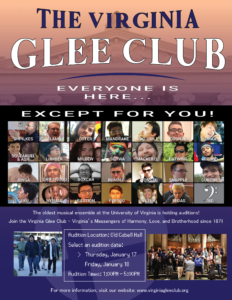 Join the Virginia Glee Club – Virginia’s Messengers of Harmony, Love, and Brotherhood since 1871. Just meet us in the OCH lobby!